I love sushi. I will pretty much always say yes to sushi. Unfortunately, sushi can be expensive, and it can be hard to find gluten free. Even if the basic ingredients are okay, you have to watch out for marinades, sauces and tempura. 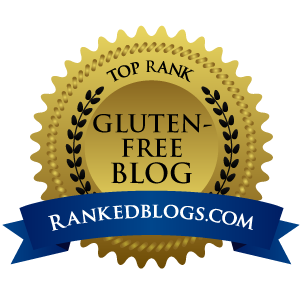 I called a restaurant once and they told me the vinegar they used in the rice contained gluten! I generally end up with simple fish or vegetable rolls with no soy sauce, and that’s just sad. From left to right: Cucumber and cream cheese, “guacamole,” “Caprese salad,” and bahn mi roll. The two in quotes were awful. 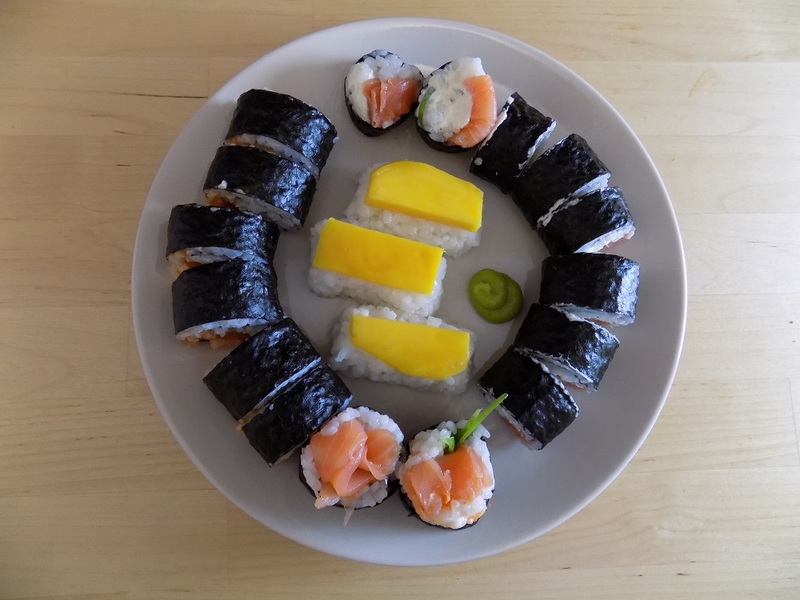 I have wanted to learn how to make sushi for ages, and recently I came across a sushi making kit in our local Lidl (cheap German grocery store like Aldi, for my US readers). The kit contained everything except fillings – rice, vinegar, nori, the rolling mat, chopsticks, and even packets of soy sauce (which I chucked) and wasabi (which was horrible.) We watched a few videos online to learn technique and then went to work. Our rolls turned out pretty great for first timers! 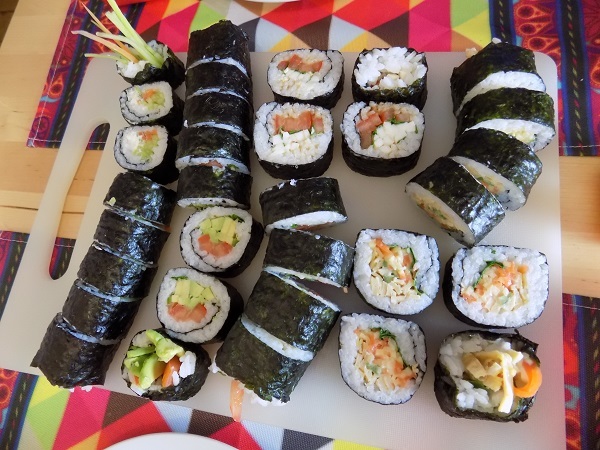 Since then, I’ve made quite a bit more sushi and I think I’ve got the hang of it. My partner Legend is vegetarian, so we’ve made a lot of vegetarian sushi. We’ve come up with a few really good combos, and since we couldn’t find many good vegetarian sushi ideas online, I thought I’d share the recipes we came up with. Once you get the basic process down, you can fill your rolls with anything you like. I use an already seasoned rice vinegar. If you use plain rice vinegar, add 1 tablespoon sugar and 2 teaspoons salt to the vinegar and mix well. First, watch these videos and learn the techniques! Rinse the rice really, really well. Some people soak it for a while, others rinse it in a colander until the water runs clear. This is a really important step – don’t skip it. Transfer the rice to a large bowl (wooden if you have it) and grab a wooden spoon. Hold the wooden spoon over the center of the bowl with the back side facing up. Pour the vinegar onto the back of the spoon, using the spoon to spread the vinegar across the rice. Gently blend the vinegar in to the rice using the technique you saw in the first video (sort of chopping through the rice sideways, NOT stirring.) Set aside and let cool. While your rice is cooking and cooling, you can prepare all your fillings. Here are some combos that we really like. Cover apple slices in lime juice and toss to coat. 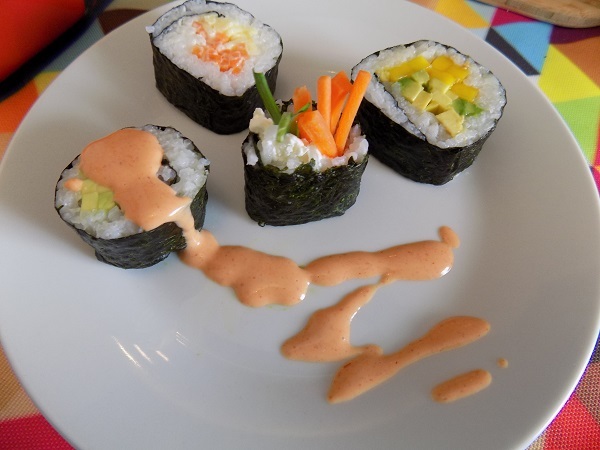 Add the carrots and apples to the sushi roll, then squirt a generous ribbon of mayonnaise across the entire filling. Drain the carrots and apples before adding to the roll. Add all the solid ingredients and top with a ribbon of mayonnaise and a drizzle of lime juice across the entire filling. Here’s my work space with mat, nori and ingredients around. My bowl of water is missing! Prepare your work space. I used a big cutting board. Wrap your bamboo mat in plastic cling wrap. (This makes clean up a breeze!) Get your nori, rice, and fillings organized nearby. Get a little bowl of cold water – this helps the rice not stick to your fingers as much, and can be used to seal the nori at the end of the roll. Finally, have a clean towel nearby, as you’ll need to dry/wipe off your hands a few times while preparing, and then clean the knife when cutting. Lay out your mat in the direction you want to roll (look at the lines on the mat, you can see it will only roll one way.) Then line up your nori in the same direction on top of the mat. The nori package should say which side is up – ours has a kind of rough texture on one side and that’s the side we face up. Cover all but a thin strip at the far end of the nori with rice. The video says to use 1 cup, but their rolls are more rice than filling. I use about a ½ cup of cooked rice. If your fingers are wet with cold water, it’s a little less sticky. It’s still kind of fiddly to work with! This is a really fat banh mi roll. This is on the high side of how much filling you can add. Once your nori is covered in rice, add the fillings in a line near the close end of your sushi. Roll using the mat, being careful to keep the roll tight and even. (The second video explains how to do this.) 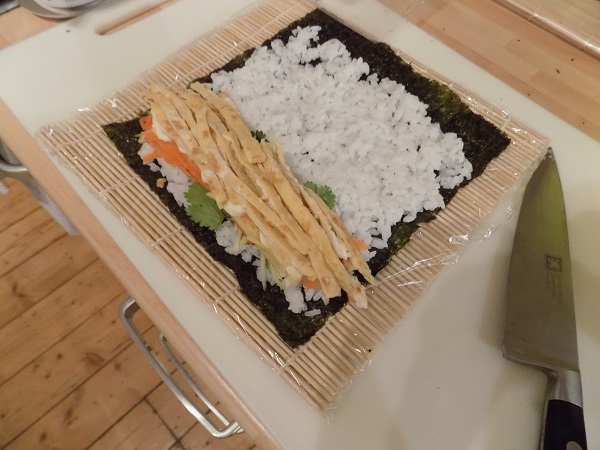 Re-adjust the mat and keep rolling until you reach the end of the nori. 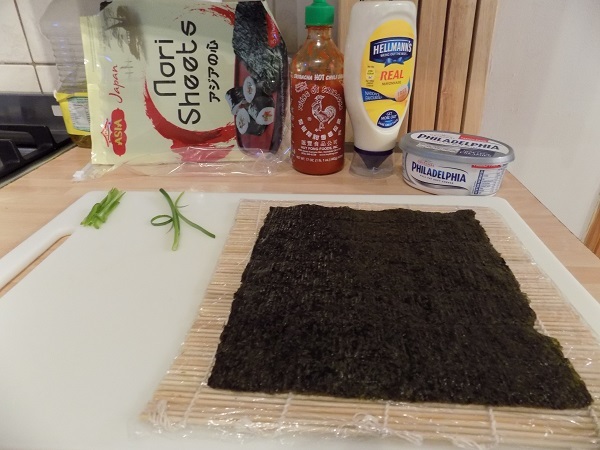 It will probably just seal on its own, but you can add a little water to make sure the dry part of the nori sticks to finish the roll. Slice the finished roll. I like to slice mine in eight pieces because they’re a bit easier to eat (slice the roll in half, each half in half, and then each quarter in half.) If you’ve made a very thin roll you may want to slice in six pieces instead. Serve with gluten free *wasabi , *pickled ginger and *gluten free soy sauce . We also like to make sriracha mayonnaise to drizzle on some of the rolls. Some sriracha mayo drizzled on a roll is super delicious. Mix all ingredients together in a bowl. Check the taste and add more mayo or sriracha to taste. My home state often does New Mexico rolls, which are usually made from tempura or pecan-breaded green chile slices, cream cheese and sriracha mayonnaise. I recently picked up a gluten free batter mix and I’m planning to try this at home soon! Of course, if you’re not vegetarian, you can add fish or even meat at will. I am a huge fan of Philadelphia rolls, which are smoked salmon, cream cheese and green onion. I have to recommend you don’t make sushi with tomatoes. We tried a guacamole-inspired roll with avocado and tomato, and another that was inspired by a Caprese salad, complete with basil and balsamic vinegar. They were both pretty much horrible. 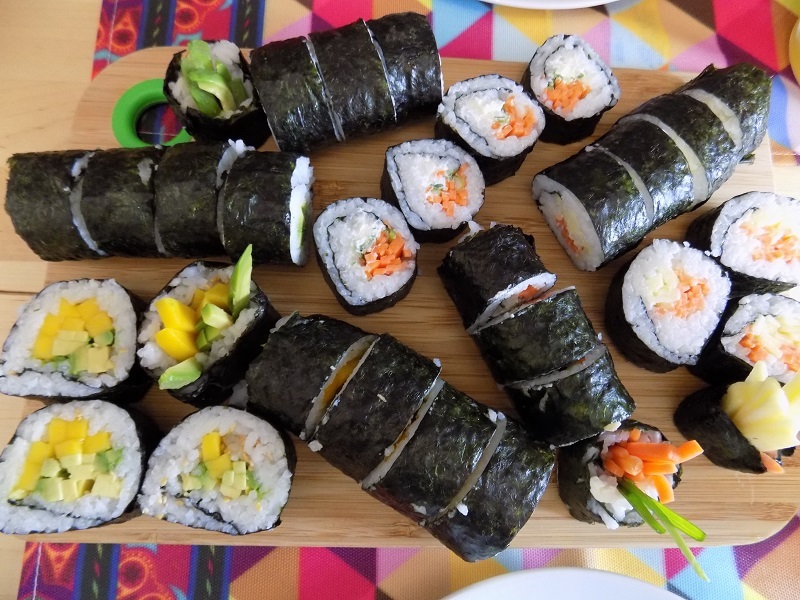 So that’s it – you are ready to make your own sushi like a pro, without fear of gluten! What is your favorite sushi roll? Have you made your own sushi before? Any tips? Leave them in the comments!